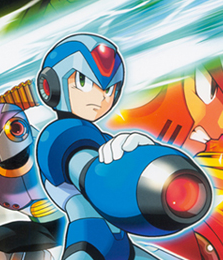 Word has it that Mega Man X, among the likes of a handful of other Capcom and Marvel characters, will be included as future DLC -- this according to none other than Lupinko, the very individual who accurately leaked the complete on-disc roster in the fall. The full DLC lineup includes: Mega Man X, Frank West (Dead Rising), Phoenix Wright (Ace Attorney), Gene (GodHand), Jon Talbain (Darkstalkers), Strider Hiryu (Strider), Gail (Dino Crisis), Dr. Octopus (Spider-Man), Juggernaut (X-Men), Elektra (Dare Devil), Apocalypse (X-Men), Iceman (X-Men), Thanos, and and Ms. Marvel. Doc Oc, Phoenix Wright, Frank, and Juggernaut are said to be officially revealed at Captivate next week, and a new court room stage will coincide with their release. It would appear that Capcom also intends on offering new stages as well. We'll see how this plays out, but, as per usual, take these rumors with a grain of salt. Please be true, please be true, please be true. If it really is Lupinko that leaked the information, my hopes are high. The only question is whether it was actually Lupinko who leaked said info, or someone using his name to spread misinformation. I remember reading a comment on Shoryuken.com in one of their articles that mentioned this list and if I remember correctly, Lupinko did not post anything on his Twitter about the list. Also, remember that April Fools is this Friday so maybe this is just a joke to piss off the fans. I could be wrong though. It seems a bit too much, honestly. It basically looks like a big huge "Oh look it's the popular characters everybody kept gushing for during the game's development for the Capcom side" list, branded as a "leak". Meh, I'm probably only going to download X, Phoenix Wright and Strider from the Capcom side. And Elektra and Ms Marvel from the Marvel side. The rest are either unappealing to me, or just seem way too impossible (especially when the devs themselves said about half of these names WERE NOT GONNA BE IN THE GAME *coughStrider and Genecough*). As much as I'd love to see them, I have severe doubts on it all. Aww, still nobody from "Breath of Fire?" Oh, well. Now that you mention it, you're wrong. I've almost completely forgotten about April Fool's Day. I certainly hope this turns out to be one big coincidence, with this information being leaked around this time, exactly two days before April Fool's. ...Whoa. How did I make THAT typo? I meant "you're right". I personally find it more weird by how big this listing is, not so much that it is comprised of the popular characters. But I do hope that X and Phoenix Wright are true. But I won't get my hopes up high either. I really hope Gene won't be in the game. If he is included, then that makes all 3 IPs from Clover Studios in the game that Capcom "STOLE." Meaning, you know...Capcom decided to dissolve them or whatever and the original creators of those games left to Platinum Games. Hm, how come my comment in the previous article regarding the Lupinko rumor isn't showing up? @ Amir: Lupinko never said anything about EXE being in MvC3. I suppose I should try to give a detailed history of leakers, fake and real, that have appeared throughout the course of the MvC3 hype train. Strap yourselves in. This is going to be LONG. The below aren't even all of the 'leaks' that have appeared over the past year - I just feel that these were the ones that had the most impact on the community and are most deserving of an explanation. Some will discredit it for getting some characters wrong, in which the current theory regarding this list was that it was a rough draft list. Of the characters that it got right, Spencer in particular was specifically stated to be based on his Bionic Commando Rearmed redesign, which is something that many consider to be near impossible to guess. This list also didn't have any incarnation of Mega Man present (although it still had Tron Bonne and Zero), meaning that if it was truly a rough draft list, all of the Rockman incarnations were ruled out early. In early October, about two days after New York Comic-Con ended, a new list appeared. At first, it only showed the Capcom side, and then the author revealed the Marvel side later. The Capcom side had obvious safe picks (or what was thought to be safe at the time) aside from Red Arremer from Ghouls N' Ghosts, and the Marvel side curiously contained Howard the Duck. This led to many fights over at GameFAQs especially. Personally, I knew this list was fake from the moment the author decided to share 'development stories'. Said stories were the kind of stuff that a real leaker shouldn't know unless they were at the highest levels of game development, like blaming Inafune for the exclusion of Onimusha and Sengoku Basara characters, and thanking a Marvel employee for the inclusion of one of the Marvel characters. This is something not many seem to know the full story behind. Understandable, considering this was an impostor posing as Kensk, the person who leaked the entire Super Street Fighter IV roster before the game was even announced. I will begin this explanation with a personal story, as this Kensk impostor made his home base in the Capcom Unity forums, particularly the Character Anticipation and Request Thread that I posted in regularly during the past half year. The Kensk impostor showed up shortly before New York Comic-Con. He was apparently a big fan of Amatsu-Mikaboshi, or was banking on Marvel using Mikaboshi in the game somehow, as he is the Marvel Universe's most recent major villain. The Kensk impostor kept on telling us that specific characters would be announced at specific events and dates. None of his guesses were right. Eventually, in mid-November, he posted a list at Capcom-Unity containing Rockman.EXE. Chances are very high that he only put in Rockman.EXE because X had been disconfirmed for the initial roster, and there was a very high amount of EXE support in the Character Anticipation and Request Thread at the time. That same list eventually made it over to Joystiq. Protodude actually made an article about it. The real Kensk at NeoGAF noticed the list, and said that the Kensk at Unity wasn't him at all. Meanwhile, mods at Unity were locking the repeated threads that the Kensk impostor created to spread his lies. One thing that I especially noticed was that some of his character choices kept changing between each list that he posted. For example, a day after that list containing Rockman.EXE was posted at Joystiq, the Kensk impostor made a new thread with a modified list that had no trace of Rockman.EXE at all, just Classic. One must note that the real Kensk only posts at NeoGAF. Not much needs to be said about this one, as we all know that this list is true. It first appeared in late October from what I've heard, and gained massive traction when it correctly predicted that Jill and Shuma-Gorath were going to be DLC characters. There was always a high amount of skepticism regarding Lupinko's leak right up to the last reveal. You couldn't go through January without noticing that the fanbase was in a civil war over whether or not this list was true. It didn't help that Capcom kept making vauge statements in order to throw people off and keep the hype alive (even if it results in a short-lived backlash afterwards). This guy showed up over Twitter mid-December, about a week before Jump Festa. He just about regurgitated everything Lupinko said, and added his own false predictions. His first prediction was that Hsien-Ko and (Jean Grey) Phoenix would be announced at Jump Festa. His second prediction was that Episode 3 (a trailer) would be revealed 'soon'. That 'soon' turned out to be true, as Episode 3 was revealed to the public about five days after he appeared. Although anyone that is capable of critical thinking would have figured out that this was a lucky vauge guess at best, because of 'soon', and the community had been expecting Episode 3 to be released to the public since mid-November. The rest of that week leading up to Jump Festa was utterly chaotic, with Hsien-Ko and Phoenix fans obnoxiously celebrating ahead of time, expecting them to be revealed at Jump Festa. The Klennox leaks finally died a firey death when nothing was revealed at Jump Festa. Okay, if this turns out to be true, Capcom will have effectively fixed everything that was ever wrong with Marvel vs Capcom 3. If this turns out to be an April Fool's from someone at Capcom, I will climb the corporate latter and punch someone square in the nuts. Basically in a nutshell... Wait and See. Remember, polls don't mean it's going to happen, and neither do the rumours. If only 4 are getting revealed next week, then Capcom could still change or add more DLC if they wanted. don't get your hopes up yet kids. Although MvC3 sold 2 million units. Let's hope for a 3DS and Wii port k kids? good news, and its pretty awesome that Doc Ock is here, but where is venom? That's a pretty incredibly DLC list. Feels almost too good to be true. I already heart MVC3 a lot. It's tons of fun to play. I love Zero and Amaterasu especially, it makes my heart swoon. But I swear to all things holy, this better be true. Mega Man X? In a VS fighter, finally? And Phoenix Wright, Strider, and Jon Talbain? Sorry to disappoint you, guys. Svensson, works from Capcom, confirmed that it is not legit which means the leaked/rumor list is fake. I highly doubt that this list is 100% fake. If it was just made by some random fan (which it isnt), Gene wouldn't be in there. Godhand was not a really popular game, ya know. @Alilatias: You sure do love well-researched comments don't you? Just stating an observation. Honestly, this is getting tiring. If Capcom really wants to keep its MM fans, then they gotta put X in it. AND Axl. Sven stated that this is not legit over on the ask Capcom forums. @ MegamanMegafan: Gene's not popular? I couldn't go anywhere in December without watching Phoenix Wright fans and Gene fans slug it out. Gene at 4th place in a fan poll. It's not like Sven would say it is legit. But the choices are very questionable. I highly doubt it's true, especially with the whole Lupinko thing. So what? Tatsunoko vs Capcom showed that even a mere PHOTOGRAPHER could fight as well as any other character. Let's not forget the many other dangerous situations that Phoenix has been in, and survived. Much like everyone here has been demanding for X, why not let the Ace Attorney fans have something they've been wanting for an awful lot too, y'know. The AA series needs an AA rep.
Frank's main role in his game was killing zombies. You need to be able to fight before you can kill. Phoenix on the other hand, iirc, has only taken part in ONE fighting scene that was fair in his whole "life". He lost. I want Phoenix Wright in this game, ALMOST as much as I want Mega Man X.
Mega Man X, mainly, because he has never been in a fighting game before. Classic, EXE, Mega Man Zero, Zero, Volnutt.. ALL have been in a fighting game of sorts. Even Roll and Tron Bonne are in fighting games. But no Mega Man X. Also. Phoenix Wright is an amazing character. I would love to see him duke it out with other Capcom and Marvel characters. Not to mention his theme song would be epic. Which is what a fighting game can do to turn that around. Capcom are a pretty creative bunch, they can certainly think of ways to make Phoenix a fighter much like with everyone else. I also heard rumors that the reason why he didn't get into TvC was because that there would be extreme syllable differences in his speeches. I take that to mean that his fighting was supposed to incorporate those speech bubbles. But honestly, Capcom are creative. If he does get in, just watch. Everybody hates the Wright, I see. Technically he didn't rule out anything. Not legit means not legal. And people actually said Capcom would deliberately hold off the characters we want for DLC. It makes me think how lucky Haggar was to get on disc since they know we would pay for the mayor. No classic Mega Man and Captain Commando? ;_; Well, hope that X, Strider, Doc Ock, and the others appear. And alternate costumes of Zero with his Zero series look, Model Z, and Model ZX. If we go well and the cancellation of Mega Man Universe, X as DLC is a way that capcom could make it up for the fans.